Зацените новинки СИ-БИ радиостанций. (Европа). Интересно - у нас те же Galaxy DX95T позиционируются как СВ-шные станции, а у производителя рабочий диапазон указан 28.315 ~ 28.755 МГц или ещё короче: "10m Radio". С дополнительным модулем, который крепится на задний радиатор - 80 ВАТТ!!!!!!!!!!!!!!!!!!!!! Новенькие аппаратики на 27-30 Мгц. Albrecht AE 7500 AM/FM/SSB CB Radio (Técnicamente el Albrecht AE7500 es muy similar al AE5890EU). HR-5500EX International Version, includes all CB bands and frequency range 25.610-30.105 KHz. Not available for sale or use in the EEC countries. The PC787 is the latest CB radio from Uniden. It replaces the PC78 series radios and has a very similar look. Right away, though, you will notice the larger meters and fewer knobs. The PC787 also uses a 6 pin microphone, unlike its predecessors. The extra-large S/RF/SWR meter lets you check you levels with a glance. The PC787 has all the features important to you: integrated SWR meter, mic and RF gain, weather alert, noise blanker, automatic noise limiter, instant channel 9/19, and more. incremento de frecuencia: 10 Hz / 100 Hz / 1 kHz / 10 kHz. Potencia del transmisor: AM / FM – 12.1 mar. SSB – 30 vatios. A new desktop radio designed to be affordable without compromising performance, the DX-SR9T boasts an analog easy-to-use transceiver featuring 3 ceramic filters with narrow modes and optional mechanical filter insertion capabilities; excellent 1ppm stability and an internal voice/data VOX circuit to easily interface the data-communication modes such as SSTV and PSK31. Yes, the DX-SR9T is a hybrid, stand-alone analog and digital SDR transceiver, featuring simple operating commands, straight forward and logical key layout assures that you can start enjoying this state-of-the-art SDR transceiver from the moment you first power up! With front-panel separation, large bright LCD display, front facing speaker, Auto-keyer and many other desired features the DX-SR9T is ready to capture the attention of everyone from a beginner in the world of Shortwave to the most experienced operators! IF shift, RIT, Noise blanker, 4-level RF preamp /attenuator, Auto-power-off, Sleep-timer, Dial/Key locks,indicator illumination and more at no extra cost. The SDR system in DX-SR9T consists of I/Q signal output and a mixer circuit. It requires a high quality sound device (internal or USB-interface) and PC specs as follows. Please remember; Higher the PC spec, Better the SDR performance! Sound device: 48KHz 16bit sampling, capable of stereo record/replay (Tested with Creative Sound Blaster series! Anytone AT-5289 FREQUENCY RANGE : 25Mhz – 30Mhz (10 / 12 Meters) POWER OUTPUT : L / 5 Watts M / 15 Watts H / 50 Watts Specification GENERAL Modulation modes AM/FM Frequency ranges 28.000-29.700MHz 25.615-31.105MHz (programmable) Antenna impedance 50 Ohms Power supply 13.2V Dimensions(in mm) 15.8X 4.8X16.5(WXHXL) Weight 1.1KG TRANSMISSION Frequency error +/- 300HZ. 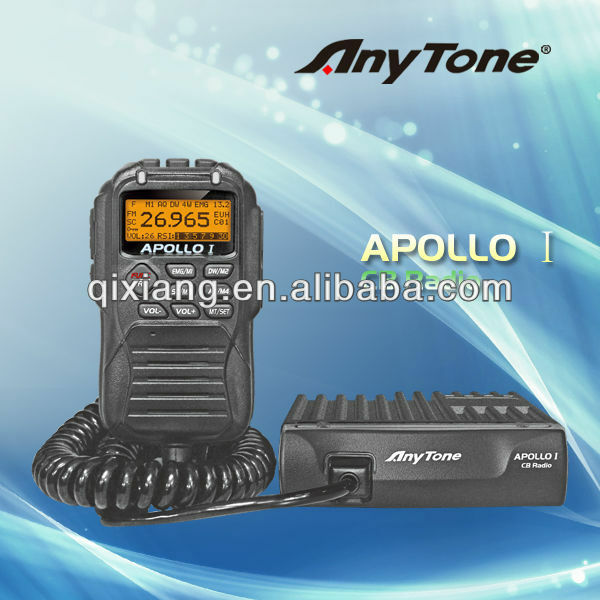 RANGER CB Radio SEA EAGLE VT Features 480 channels 10/11/12 Meters Width Frequency Range Radio AM 5 watts FM 10 watts Frequency Display Scan Function 7 Color Display Specification General Channels 480 Frequency Range 24.265 ~ 29.655MHz Emission AM/FM Frequency Stability 0.001% Operating Temperature Range -20 °C ~ +50 °C Power Source 13.8 VDC Antenna Impedance 50. Новая радиостанция еа 27 Мгц, с полным управлением на тангенте. Еще один аппаратик на 10-11 метров. Все те же станции, только с новым брендом. CRT 4CF --> ANYTON AT-298UV --> KENWOOD UVF-1 TURBO. Выходная мощность: 4 Вт, 15 вт. А чем она лучше других? Кроме 15 ватт. Ну, не все новые станции на 27 мгц, могут нести на борту функцию CTCSS. В условиях помех на 27 мгц, актуально. http://radiochief.ru/obzory/obzor-radiostantsii-anytone-apollo-2/ - более подробны отчет.